Home › David Hume › A Rumor of Empathy: Rewriting Empathy in the Context of Philosophy, the book, now available…. Here is the short version of the short version: The deep, underground history of empathy is surfaced and reconstructed in Hume, Kant, Lipps, Freud, Scheler, Stein, and Husserl. A rumor of empathy is engaged in vicarious feeling, receptivity, empathic understanding, empathic interpretation, and empathic intersubjectivity. A rumor of empathy becomes a scandal of empathy in Lipps’ projections and Strachey’s mistranslations. Empathy is reconstructed in Hume’s many meanings of “sympathy”; in Kant on “the communicability of feelings” and “enlarged thinking” of the other; in Freud’s introspection and free association; in Scheler’s “vicarious experience” and perception of The Other; in Stein’s sensual empathy; and in Husserl’s late writing on empathic windows of consciousness accessing other persons as Husserl’s empathy moves from the periphery to the foundation of community. Yet when all the philosophical arguments and categories are complete, the phenomenological methods reduced, and hermeneutic circles spun out, in empathy, we are quite simply in the presence of another human being. For those who knew Michael Franz Basch personally, see the tribute to him in the Preface – an empathic moment indeed. The work is also available as a more reasonably priced electronic version. Available to ship as of this date (2014/11/24). 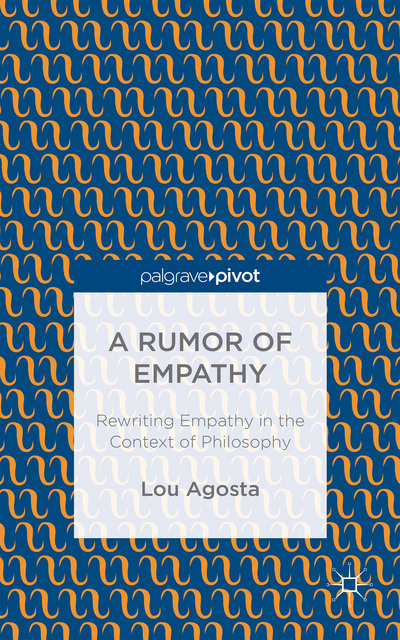 “Okay, I’ve read enough – I want to order to book.” Click here to order from Amazon – A Rumor of Empathy: Rewriting Empathy in the Context of Philosophy. This post and all the processes and contents of this web site (c) Lou Agosta, Ph.D.